As babies, their frequent, shrill cries demand our attention at inconvenient hours. As toddlers, they pull our stuff out of drawers; they ask Why?, even though we’re pretty sure they don’t care about the answer. In the moment, those phases may seem like they won’t end, yet they do. But around preschool age, children begin to attempt bargaining with their parents. And it won’t end soon. Your response to these situations will significantly impact your parent-child relationship and the mood in your home. Parents normally choose one of three responses to their children’s bargaining attempts: Controlling, Compromising, or Caving. Below is a table that describes the similarities and differences. Wishes & Preferences Parent states their desired outcome. Child may or may not be allowed to state their desired outcome. Parent and child both state their desired outcome. Parent and child both state their desired outcome. Negotiations No back and forth exchange of ideas. Back and forth exchange of ideas. Back and forth exchange of ideas. Win/Loss Record Parent gets exactly what they desired. Child loses. Both parties get some of what they desired. Parent and child both win. Parent loses. Child gets exactly what they desired. Emotional Result Parent walks away satisfied. Child walks away feeling unheard, frustrated, angry, or resentful. Parent and child both walk away satisfied that their opinions have been heard and their needs met. Parent walks away feeling defeated, disrespected, frustrated or resentful. After explaining a bit about each of these approaches, I’ll give a brief scenario that illustrates the similarities and differences. A parent must occasionally employ a controlling response. In an emergency situation, for example, there is no room for bargaining of any kind. This applies to obvious things like fire or other imminent danger. But here’s another example where I recently used an controlling approach. My son’s school bus was due to drop him off at any moment. Normally, I allow him to walk home from the bus stop on his own. On this particular day, my preschool-aged daughter was playing in the basement. Unexpectedly, a severe rain storm blew in and the sky quickly went from blue to dark gray. I knew my son wouldn’t have an umbrella or rain coat with him. I called to my daughter, “Come upstairs and put your shoes on right now. We have to drive down to the bus stop and pick up your brother.” She did as I asked and we were out the door in about 60 seconds. Children who are repeatedly exposed to a controlling parent response will tend to become frustrated, angry and resentful. However, my daughter didn’t feel any of those things after this incident. That’s because I normally allow compromise. On the rare occasion when I resort to controlling mode, my kids have come to understand that I have a good reason and they’d better listen. A controlling response shouldn’t be your usual approach. The more often you use it, the more it will be met with resistance. Likewise, the caving response needs to be used sparingly. (Really, almost never.) Your child may beg and plead until you can’t stand it. Be aware, though: If you say “No” to the first 9 requests for candy but say “Yes” to the 10th, you will regret it later. In your child’s mind, everything is now open to negotiation. The message you are sending is, I can be worn down. My mind can be changed by excessive appeals. When I sound increasingly frustrated, that means you’re about to break me. So keep asking. I have changed my mind a few times after my kids gave me good, supporting reasons for their requests. Suppose I change my mind and say “Yes.” You may look at that exchange and think that I caved. But the fact is, my mind was changed by sound logic and respectful dialogue. Attempts to wear me down through whining or repetitive pleas won’t be well received. 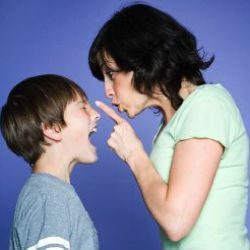 If your child’s incessant requests are driving you nuts, say, “I’m not going to discuss it any more. I heard your request, I gave you my answer, and it’s final.” Don’t respond to their attempts to discuss it further. Strike the pose of a brick wall and stick with it. The world would be happier if people were more willing to compromise, wouldn’t it? Legislators could get valuable work done; society would see less violence; more marriages would thrive… Teaching your child the art of compromise will better prepare him for the future and make for a happier life in the meantime. Here’s why. Children learn to express their opinion. 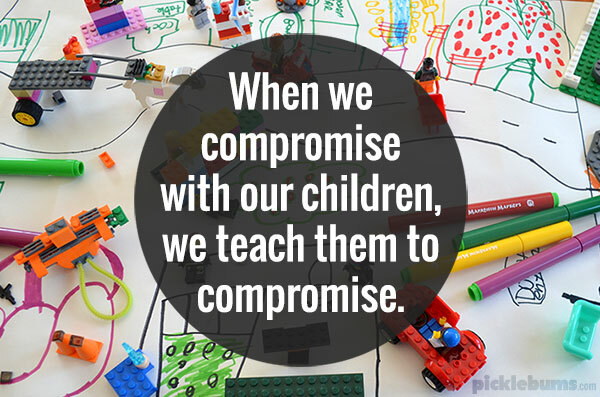 Compromise is a valuable communication skill which will benefit your child at school, work, and in personal relationships. Modeling compromise in your home is a great way for them to start learning. Children thrive when they feel important. How many times have you felt frustrated when someone – such as your boss – refuses to listen to your advice? Now imagine being a child, living with that dynamic in your home. Considering your child’s input says, I respect you as a person. You are a valuable part of this family. A child who feels heard is going to be less likely to throw tantrums or act out in other negative ways. Children want an adult to be in charge. They really do. Just like most of us want someone else to be President of the United States. It may seem cool at first to have the President’s motorcade and Air Force One at my disposal; to live in the White House; to have a personal chef who cooks whatever I want. But after about two hours of that luxury, I’d be done. Time to visit the Situation Room and make life and death decisions? No, thanks. Time to meet dignitaries in the Oval Office and shape world-changing foreign policy? Pass. We like to vote, to write our Congressman, to have a say in the laws of our country. Most of us, though, don’t really want the responsibility carried by our Commander-in-Chief. Likewise, kids want to be involved in the family decision-making process. But it would be unwise to hand them all the power. In fact, it’s unfair to do that. Letting them feel as though they are in ultimate control places an adult-sized burden on their very small shoulders. When you compromise with them, you clearly show you are carefully weighing the factors, but the power ultimately rests with you. While they may balk at this power structure from time to time, they really don’t want – and can’t handle – the responsibility. Fighting feels gross. I suggested earlier that you strike a brick wall pose when your kid is trying to wear your down. It’s an effective – and sometimes necessary – technique, but it’s not particularly fun. No child enjoys being controlled all the time and no parent enjoys acting like a Drill Sargent all the time. Children – and parents – become anxious and depressed when they constantly live in an emotionally charged environment. Your family just finished dinner at a restaurant. As you’re getting ready to leave the restaurant, you announce one final stop on the itinerary: the library. Your child says, “I don’t want to go to the library. It takes forever. I want to get home and shoot hoops before the sun goes down.” You respond that your family needs to return several books before you start racking up library fines. Your child maintains that he does not want to stop at the library. My oldest child has wanted to be part of the decision-making process since he was old enough to speak. He is a master at negotiating. Once he understands the factors involved, he sometimes suggests the plan that satisfies everyone. That kid can compromise like crazy. Occasionally, you will find that no matter what compromise you offer, your child just isn’t interested. He wants it done his way and that’s all. In that case, you may be tempted to go the controlling route. (“Hey, you can’t even handle just stopping at the book return? Fine. We’re going to BROWSE and we’re STAYING until the place CLOSES. No basketball for you!”) After all, you tried to meet him in the middle and he showed no gratitude. But he’s a kid and you’re an adult. You said you would briefly visit the book return and then get him home. So be kind, even if he isn’t. Keep your promise, even if he doesn’t. He may be crabby, but your response will make an impression. So choose well.